As you can see, both Tasks has 3 days Duration. I added two more columns to the Gantt Chart View: Work, and Type! As you can see Work for the Task 1 is 40 hours (as expected), but for the Task 2 it is 0 hours. How is it possible? Even if this does not make a sense it is possible because Task has fixed duration, so it is supposed to be worked on from Monday 11.06.2018 to Friday 15.06.2018, and the Resource is unavailable at that specific time. So, when you assign Resource to the Task which is Fixed Duration type be aware and careful on that. Now, as we know, Mary is on her Vacation from 11.06.2018 to 17.06.2017, and Task 2 has now Duration from 12.06.2018 to 19.06. So Mary is available at Monday 18.06.2018, and Tuesday 19.06.2018, but the work for her is still 0 hours. You can see that nothing has changed in work for Mary in this example either. Now you can see that Mary will work from Tuesday 05.06.2018 to Friday 08.09.2018 (e.g. total 32 hours), and next Monday, 11.06.2018 she will not, because she is on Vacation and therefore not available. When you assign a Resource to the Fixed Duration Type, work will be calculated according to available time of that specific resource during specific Task period. 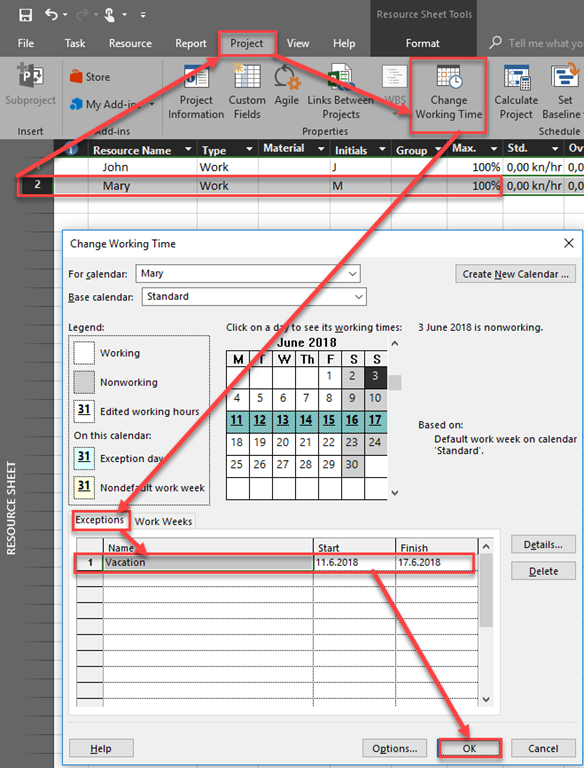 If Start date of the Task is moved for any reason for the Task and Resource is became available for it (for specific or whole duration), MS PROJECT will NOT recalculate work for Resource! It will remain 0. So for this you should reassign same resource to the Task. This entry was posted in Micsrosoft Project 2016, PMI, PRoject Management and tagged Micorosft Project 2016, Micorosft Project 2016 - Resources, Micorosft Project 2016 - Schedule. Bookmark the permalink. Hi Nenad: I have a question related to use of resources in MSP, how can I send this to you?